After introductions, we’ll ask you detailed questions to better understand your hearing health background. Because hearing loss is accumulative throughout your life, we want to understand what your ears and brain have experienced from childhood to the present day. Did you grow up on a farm? Do you shoot guns and/or hunt? Did you attend a lot of rock concerts as a teenager? All of this noise exposure helps create the picture of your unique auditory system. We will also ask questions about whether tinnitus (ringing in the ears) or balance problems are a concern. We’ll discuss your medical history, occupational and/or recreational noise exposure, listening environments and your overall lifestyle. Next, we look in your ear canals with our video otoscope and take a picture of your tympanic membrane (eardrum), which we share with you. We may also determine the health and mobility of your eardrums and middle ears via tympanometry, using our specialized equipment. Afterward, you will enter our sound-treated booth where we give you the task of clicking a button whenever you hear a distant beep. The diagnostic hearing test takes approximately 20-25 minutes and is similar to listening to different notes on a piano. During the test, you listen to different frequencies ranging from low to high pitch, as your audiologist tests the specific frequencies necessary for speech understanding. During the hearing test, your audiologist measures the softest sound you can hear at each frequency, called your hearing threshold. You may listen to tones via air conduction (using insert earphones similar to foam earplugs placed in your ear canals) and bone conduction (a different type of headphone that diagnoses if your hearing loss is originating from your outer/middle ear or from your inner ear). You also repeat lists of words in quiet and repeat sentences in varying background noise. We present recorded speech at a loud but comfortable volume and ask you to repeat what you hear to see what your brain currently understands. Word understanding comes from your auditory nerve and brain therefore this testing provides a more thorough picture of your auditory process. hearing thresholds for adults and children range between 0 to 20 dB. Hearing loss exists when your hearing thresholds fall outside of the 0-20 dB range of normal hearing. The audiogram plots your hearing loss by varying degrees of loss, not percentages. The degrees of hearing loss vary from mild, moderate, moderately-severe, severe or profound, and the shape, or configuration, of hearing loss varies from person to person. The purpose of diagnostics is to determine if your hearing loss is originating from your outer and/or middle ear, which is typically temporary or medically/surgically treatable (conductive), if your hearing loss is originating from your inner ear therefore a permanent hearing loss treatable only with hearing aids (sensorineural), or a combination of the two types of losses (mixed). Once the testing is complete, we will explain your results in an easy, understandable manner. If you have a hearing loss, we will explain the extent, type, and specifics of your unique hearing needs. 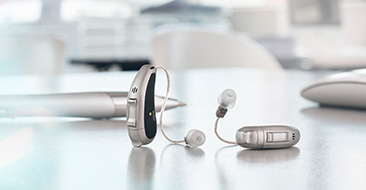 If it is determined that you could benefit from hearing aids, we will readdress your listening environments & overall lifestyle to discuss the different technology options available, as well as you budget. We highly recommend you bring a loved one with you to your appointment, whenever possible. Hearing loss impacts not only you, but also your communication within family and social relationships. Therefore, it helps to have your spouse or adult child at the appointment to help understand the information and recommendations for treatment.